“All Together Now” is a song by the Beatles written primarily by Paul McCartney and credited to Lennon–McCartney. The song was recorded during the band’s Magical Mystery Tour period, but remained unreleased until it was included on the Yellow Submarine soundtrack. It was released as a single in 1972 in European countries such as France and Germany, backed by “Hey Bulldog“. McCartney described the song as a children’s sing-along with the title phrase inspired by the music hall tradition of asking the audience to join in. He also described a “subcurrent” in the song, a dual-meaning where “we are all together now.” According to music critic Tom Maginnis of AllMusic, McCartney created the song “to match the same light-hearted spirit” of “Yellow Submarine“. Mark Lewisohn reported that the “party-style” backing vocals were provided by “whoever happened to be around“. 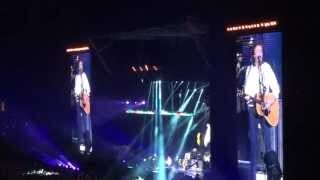 Paul McCartney performed the song live for the first time by any Beatle on 4 May 2013 at the Estádio Mineirão, Belo Horizonte, Brazil. He subsequently played it throughout his 2013–15 Out There tour. It’s really a children’s song. I had a few young relatives and I would sing songs for them. I used to do a song for kids called Jumping Round The Room, very similar to All Together Now, and then it would be ‘lying on your backs’, all the kids would have to lie down, then it would be ‘skipping round the room’, ‘jumping in the air’. It’s a play away command song for children. It would be in G, very very simple chords, only a couple of chords, so that’s what this is. There’s a little subcurrent to it but it’s just a singalong really. A bit of a throwaway. “All Together Now” has been played in 89 concerts and 1 soundchecks.